Cycling, trail running, hiking, fishing, you name it, Dahlonega has always been a haven for outdoor activities. 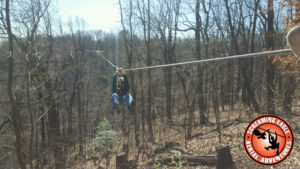 Now they’ve got something else for all the adrenaline junkies out there—a zip line canopy tour! 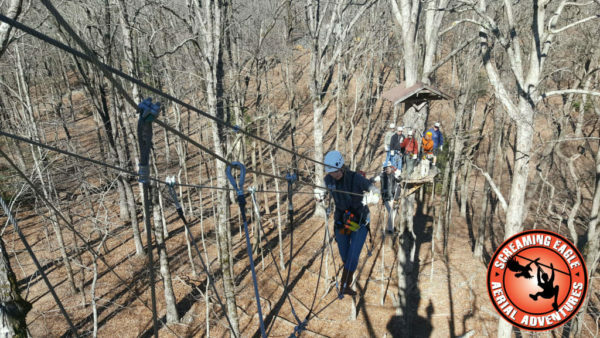 Introducing the newly established Amicalola Aerial Adventure Park located within Georgia’s beloved Amicalola State Park and just a twenty-five minute drive from Long Mountain Lodge. Tours range from 2 to 4 hours. App Studios’ Harold coming in fast for a landing. The one is specifically for kids at least eight years old and fifty pounds. This one is 1.5 to 2 hours! There are 9 ziplines ranging from 75 feet to 1,000 feet in length including 3 suspension bridges suspended in the tree tops. On the 1,000 foot zip line, be sure to look right. There’s an unprecedented view and it doesn’t last long as you could be going up to 40 mph! This one consists of all 9 of the Level I lines and all 3 suspension bridges plus an additional 7 ziplines and 3 more bridges. The longest run on the Level II Tour is over 2000 feet long and 350 feet high! If you’re ready to book your tour, you can book directly through their website. If you’re up for the adventure, the Level II Zipline Canopy Tour is definitely the best bang for your buck! I myself had the privilege of going on the Level I tour with my colleagues from App Studios. We serve as the marketing arm of the Lodge. Man, was it a blast! I’m not particularly fond of heights. This windy winter day was no exception. Looking up to the swaying treetops, I felt a twinge of nervous excitement—perhaps more nerves than excitement. However, during the safety demonstration the guides put me at ease. The way they’ve got you clipped into the lines, there is literally no way to detach yourself until you’re safely on the ground. When we walked up the stairs to the first platform the ease that I had felt during the safety presentation turned to butterflies. I stepped up to the edge of the platform. “Go,” the aptly named guide Sky said. As I jumped off the platform, the exhilaration and freedom I felt was unprecedented. Flying between trees at 30+mph I felt like a squirrel. That sounds inelegant. A bird. I felt like a bird. The longest zipline was the obvious favorite. 1000 feet between two mountains. On clear days you can look to your right and see the King and Queen buildings some 70 miles away. Still not up for it? 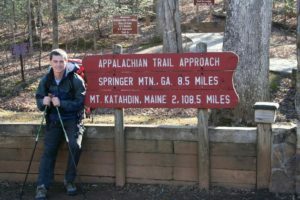 My brother starting his nobo, northbound, thru-hike of the Appalachian Trail whose approach trail leaves from Amicalola State Park. 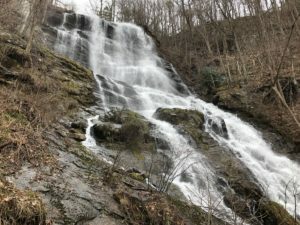 Amicalola is home to a number of fantastic hiking trails including the 8.5 mile approach trail to the southern terminus of the Appalachian Trail, Springer Mountain. Other trails include the hike up to the top of the falls, ascending 730 vertical feet of stairs in about a mile! Though difficult, this is the best way to get up close and personal with the falls. 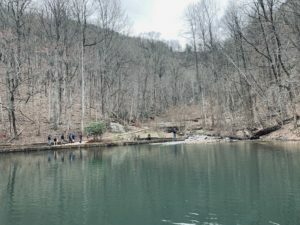 For you fishermen out there, there’s a great opportunity to reel in some stocked rainbow trout in the pond at the base of the falls. Easily catch your limit for a tasty dinner or catch and release all day long! While the visitor center may not see like the most exciting place to visit, it truly does have a lot to offer. Come and see a selection of reptiles that can be found roaming or slithering around the park. Read up on the history of the Appalachian Trail. You may even get a close up encounter with their rescued birds of prey! 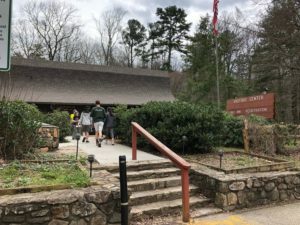 Amicalola is just a short drive of twenty-five minutes from the Lodge, so when you book your stay at the Lodge be sure to add it to your list of things to do in Dahlonega. Check out this drone footage I shot at the park after a rainstorm.